Photo from the Galen Gonser Collection, ca 1875. 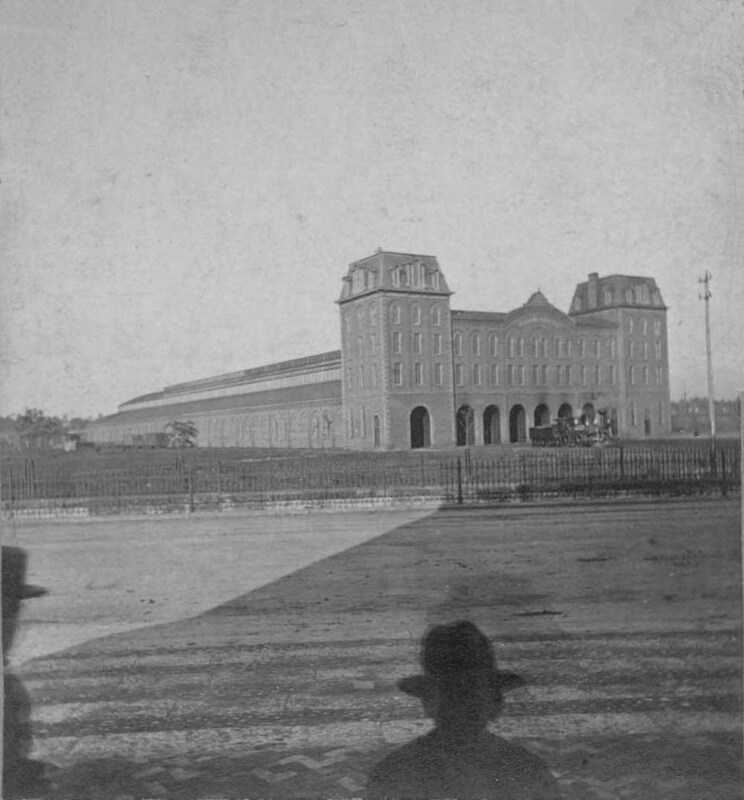 This stereoscopic photo is possibly the earliest photo taken of the second Union Depot. The depot construction is complete yet the surrounding tracks haven’t been built out. The train shed is 600 feet long. 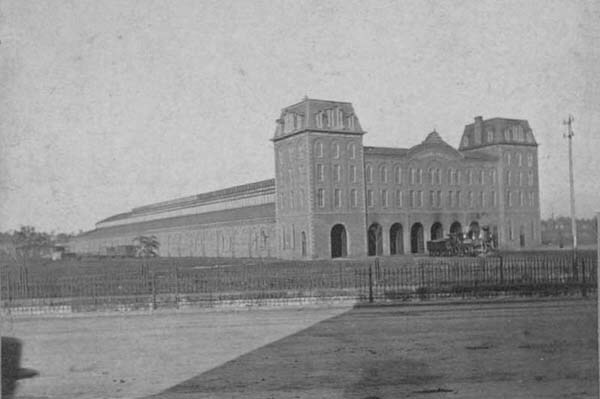 This was an imposing structure compared to the 1851 wooden Union Depot No. 1. The north entrance to the twin High Street tunnels under the depot tracks with its stone wall and iron fencing can be seen. Judging from the shadows it is late afternoon or early evening. 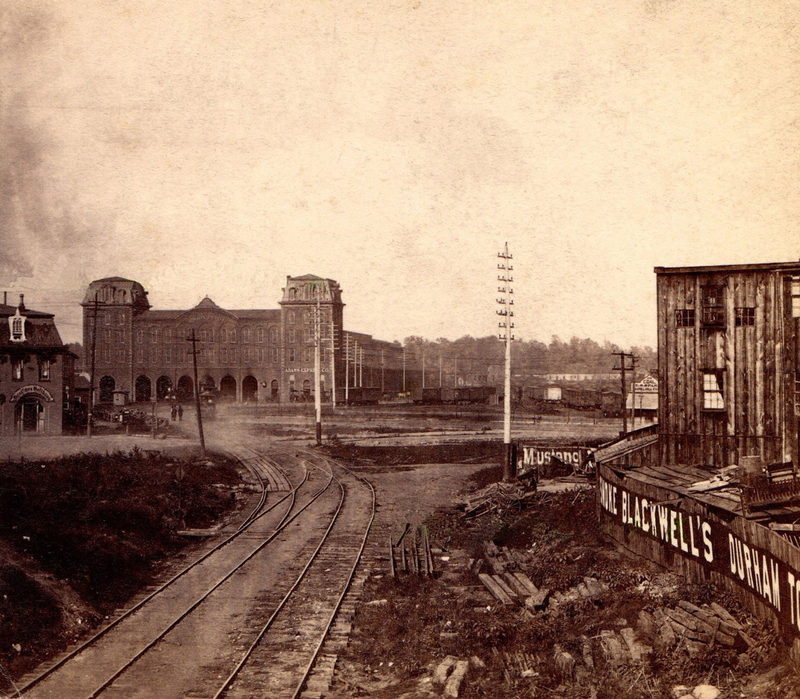 Photo from the Alex Campbell Collection, ca 1880. 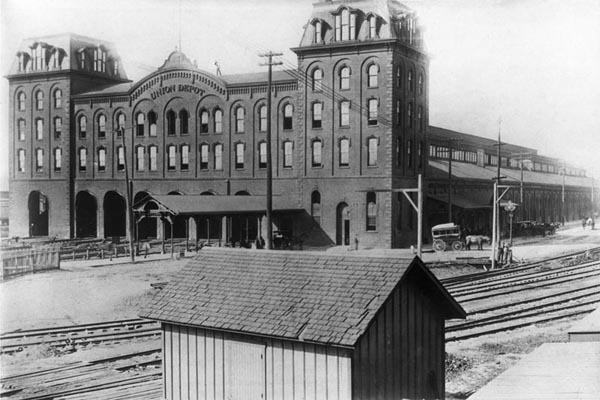 Another early stereoscopic photo of the depot. The camera is looking east with the Pittsburgh Cincinnati & St. Louis Railroad (Little Miami Line) in the foreground. An Adams Express Co. sign can be seen on the south tower. There is no rainy day canopy over the front entrance. The south entrance to the High Street tunnels can be seen when you click on the photo to enlarge it. Ten tracks cross over the tunnel leading to the depot and bypass tracks for freight trains. Photo from the Donald A. Kaiser Collection, 1890-1895. A canopy and walkway have been added to the front of the building for the passenger’s entrance. The Adams Express Co. sign is gone from the front of the building. Click on the photo to enlarge it and you will see the baggage entrance behind the horse and wagon on the right. There is an extension on the south side of the building reminiscent of a small town depot for the baggage entrance. 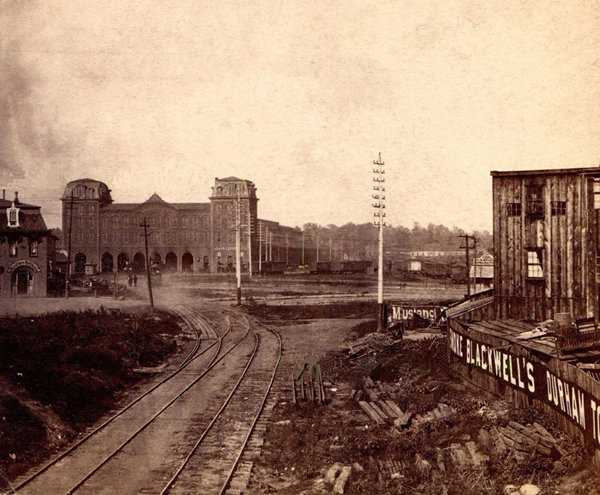 Photo from the Donald A. Kaiser Collection, circa 1890. The camera is looking northeast from the west side of High Street. The south entrance to the tunnel can be seen in front of three small buildings. There was a stub streetcar siding that ran along the west side of the tunnel fence used to hold streetcars that terminated their run at the depot. One horse car is waiting on the siding until time to leave on its southbound trip. At each side of the photo can be seen the corner of a hotel. On the left is the Powell House and on the right the Davidson Hotel. The telephone and telegraph companies have been expanding their business with the tall poles strung along High Street. Naghten Street runs east between the Davidson Hotel and the three small buildings. The south ramp to the tunnel had a steeper grade than the north ramp just so it didn’t block Naghten Street. Photo from the Columbus Metropolitan Library Collection, September 1888. A photo taken during the 1888 Grand Army of the Republic (G.A.R.) encampment and reunion held in Columbus. The track switch used to divert northbound streetcars to the waiting track is visible. The waiting track holds two horsecars. Northbound cars not diverted to the waiting track will enter the ramp to the tunnel. Flags, decorations and a Cincinnati banner welcoming G.A.R. delegates can be seen. The three story Powell House with its nine chimneys sits at the intersection of Maple and High Streets. In the far distance the tower is part of the Park Hotel at Goodale and High Streets. 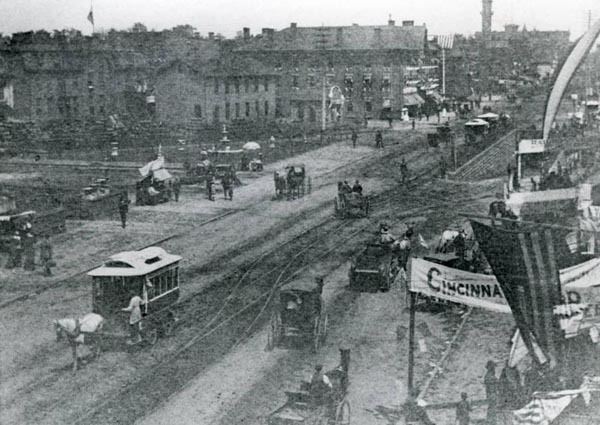 The horse drawn streetcars could not handle the large G.A.R. crowds travelling to the Ohio State Fair grounds. 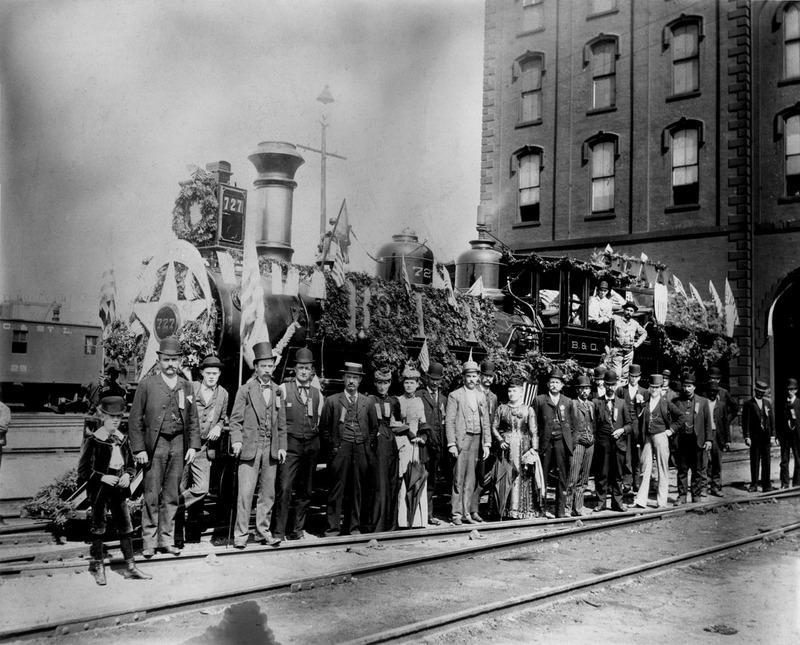 A special steam powered train was operated between the Union Depot and the fair grounds for convenience of the delegates. B&O No. 727 in festive array is spotted in front of the depot ready for a local Brotherhood outing. In the left background is a Pittsburgh Cincinnati & St. Louis Railroad four wheel caboose.